Whole Foods provided employee Milan Ross and his family with the medical insurance they so desperately needed. But it wasn't until Milan was offered the opportunity to attend Dr. Stoll's Total Health Immersion program, paid for by Whole Foods Market, that his life totally changed. 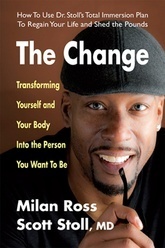 The Change not only tells the personal story of Milan Ross, but also provides the voice of Dr. Stoll, who takes the reader through the very same program that Milan experienced. Unlike weight-loss books that offer "quick-fixes" to lose the pounds, The Change is designed to look within each individual to see what is driving him or her to eat food that is known to be unhealthy so that readers lose weight not for a month but for a lifetime. Dr. Scott Stoll, MD, a former Olympic athlete, received his medical degree from the University of Colorado. He is board certified by the American Board of Physical Medicine and Rehabilitation and currently serves as the medical director for the Center for Advanced Spinal Solutions at Coordinated Health. He specializes in regenerative medicine, utilizing natural treatments, diet and lifestyle to aid the body in healing chronic disease and injuries.